﻿ HuntingNut » Forums » Hunting » Waterfowl Hunting » playing with the reed. Posted: Tue May 17, 2011 12:59 am Post subject: playing with the reed. 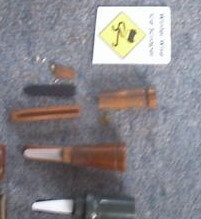 Ive had an old scotch goose call for 15 odd years and the plurry thing has driven me nuts everytime Ive gone to use it. it would squeel or break at the wrong time and no matter how much I shifted the reed I just wasnt happy with it . Tonight I got serious and dug out a old window scrapper/credit card type thinggy and took to it with the sissors to cut a new reed similar to the original from the caller. I tried it and it wasnt too bad but with similar tendasies to the original. soo I got out a sharp knife and shaved/scrapped it down to make it thinner tried it again, tootooed a bit more shaved a bit more tootooed abit more and Bobs your uncle shes a goer . sounds better than new and I can do a good parrie call on it too. If you have an old caller give it a whirl it took about half a hour and was quite alot of fun . Posted: Tue May 17, 2011 3:02 am Post subject: Re: playing with the reed. Elvis, technicians use a kind of filler blades to line out machinery/bearings. These blades come in different thicknesses and are available in stainless steel. I used a stainless steel filler of 0,1 mm sold by SKF (bearingproducer) to repair my duck/crow -call and it's working better than before. Posted: Tue May 17, 2011 3:32 am Post subject: Re: playing with the reed. Post a pic of your critter call Elvis...I'm interested in what it actually looks like mate. Posted: Tue May 17, 2011 7:54 am Post subject: Re: playing with the reed. These blades come in different thicknesses and are available in stainless steel. Elvis is a do-er, not a whiner, fixes it and gets on with life. We gots ducks that land in our pool at times, come over from the wetlands. I like trying to coax them in for a pass from my balcony. Kinda gotta be careful about that, some like it and sometimes take up roost, then it's off limits to the jacuzzi cuz of the tree-huggers! Pretty tricky landing but they do it with style. Then they battle over the jacuzzi- pretty funny. Ducks are pretty neat critters. Posted: Fri May 20, 2011 5:03 pm Post subject: Re: playing with the reed. the longer wooden call a olt66 the best up close n quiet call around great to use but Nathan has pinched it now I have the brown sugar. 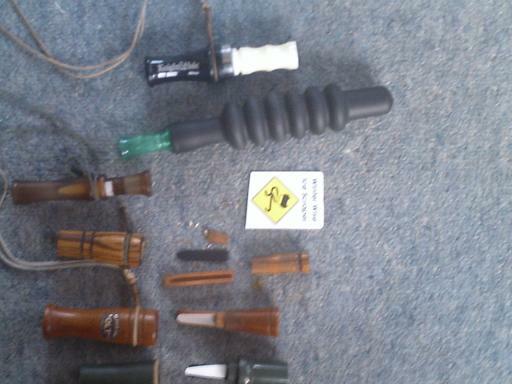 the green machine is my old scotch goose call with new doctored reed cut from the card shown, the parries like the sound and ol Harry hawk comes over for a look when I blow it so the sound must be ok.